Preheat grill on setting 5. Whisk together oil, vinegar, lime juice and zest, honey, salt and pepper. Lightly brush some of the dressing over the cut side of each avocado half. In separate bowl, toss the prawn with 2 tbsp. of the dressing. Grill prawns for 2 or 3 minutes per side or just until pink. Grill avocado halves, cut side down, for 2 or 3 minutes or until well marked. Score flesh of each avocado half into 6 strips; run a spoon between flesh and peel to release strips. 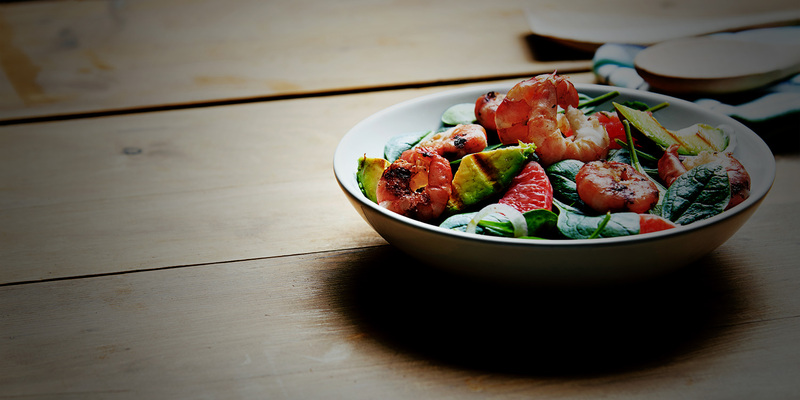 Toss together avocado, shrimp, baby spinach, red onion and grapefruit with remaining dressing until coated. Tip: Garnish the salad with crumbled goat cheese and toasted almond slices if desired.